This month, we were delighted to be invited to London to participate in a conference hosted by Health Education England (HEE), called ‘Show and TEL‘. This was a showcase of various innovative healthcare e-learning projects, as a prelude to launching an online ‘hub’ later this year, dedicated to Technology Enhanced Learning (TEL). This hub is intended to be a gateway to existing online materials, with the idea that resources can be shared and rated by users. We were invited to talk about our Mini-GEMs project, which HEE told us they felt was representative of the type of material that they would like to link to. We’re honoured to say that all our Mini-GEMs will be available through the TEL hub at launch, which will hopefully raise the profile of the Mini-GEMs and the number of people that are able to benefit from them. We were in some esteemed company at the conference, and there were many examples of new technology, innovative ideas and enthusiastic educators. We feared that our concept of educational YouTube videos would not generate much excitement when we discovered our stand at the event was next to a surgical team demonstrating their hi-tech ‘Google Glass’ project! 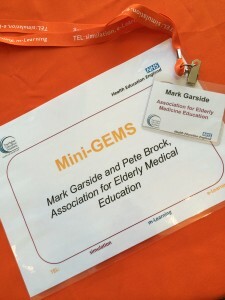 However, we were relieved to find that there was a lot of enthusiasm for the Mini-GEM format, in particular due to their potential to become ‘Reusable Learning Objects’ (RLOs) or, if you’re feeling less formal, ‘learning nuggets’. This means that as well as being standalone learning resources in their own right, they are easy to embed within larger e-learning packages as part of a more extensive collection of material related to a particular subject. We’ve already been approached by a number of people asking to link to the videos from their own materials and intranets. The beauty of YouTube for hosting the Mini-GEMs is that this integration can happen seamlessly, and is part of the attraction of #FOAMed (Free, Open-Access Medical Eduation). Aside from removing the videos from YouTube, there’s actually nothing we could do to stop people doing using them like this without asking (not that we would want to). It’s great that people do ask though, only because we’d love to learn about the contexts in which educators would like to use our materials. Exciting times ahead for Mini-GEMs!